Connect your VGA monitor to a DisplayPort equipped computer. 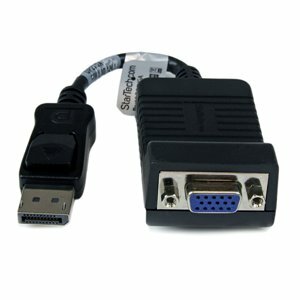 The StarTech.com DP2VGA DisplayPort to VGA adapter lets you connect a VGA computer monitor to a DisplayPort video card or other DisplayPort source, eliminating the expense of upgrading the monitor for compatibility.The DP to VGA adapter uses an integrated chip to provide an active digital to analog conversion. The DP to VGA adapter uses an integrated chip to provide an active digital to analog conversion.